Sidney loves pie—all kinds of pie, even the ones not meant for dessert. 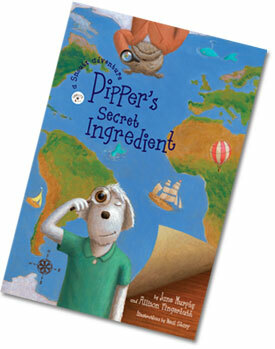 Here’s one of Pipper’s favorite recipes – a savory concoction that is great for lunch or dinner. You can use a store-bought pastry crust. Or course, Pipper likes to make her own. To the bowl of a pastry mixer or food processor, add the flours, dill, and salt. Mix to combine. Add the butter and oil and mix to a crumb-like consistency. Slowly, add enough water until the dough begins to form a smooth clump. On a lightly floured surface with a floured rolling pin, roll the dough to fit a 10 inch pan. Transfer the dough to the pan. Use your fingers to form a fluted edge. Using a fork, poke tiny holes evenly over the pastry bottom. Pre-bake for 10 minutes. Remove from oven, keeping the oven on. In a parchment-lined baking pan, place the salmon. Cover with the lemon juice, and roast for 20 minutes, until cooked through. Remove to a large mixing bowl and set aside. In a large skilled over medium high heat, heat the oil (with an adult in charge!). Add the leeks and cook, stirring frequently for 5 minutes. Add the zucchini, salt, and pepper and continue cooking, stirring frequently for another 3 minutes. In a large mixing bowl using a fork, break up the salmon into shreds. Add the yogurt, leek/zucchini mixture, egg, and the dill. Combine well. Fill the pre-baked pastry shell with the mixture. 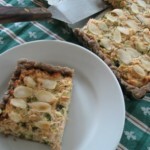 Top evenly with the almond flakes and bake for 15 to 20 minutes, until the almonds are lightly browned. Do you have a savory pie recipe you love? Please share in our comments.